lower right in graphite: Imprimee par l'artiste et M. Leroy / Mary Cassatt / (25 epreuves); lower left in graphite by unknown hand: A.
Awash in Color: French and Japanese Prints, David and Alfred Smart Museum of Art, University of Chicago, Chicago, 2012 - 2013. Three Centuries of American Prints: from the National Gallery of Art, National Gallery of Art, Washington; National Gallery in Prague, Prague 1; Antiguo Colegio de San Ildefonso, Mexico City; Dallas Museum of Art, Dallas, 2016 - 2017, no. 54. Breeskin, Adelyn Dohme. Mary Cassatt: A Catalogue Raisonné of the Graphic Work. Washington, DC: Smithsonian Institution Press, 1979, no. 148, v/v. Mathews, Nancy Mowll, and Barbara Stern Shapiro. 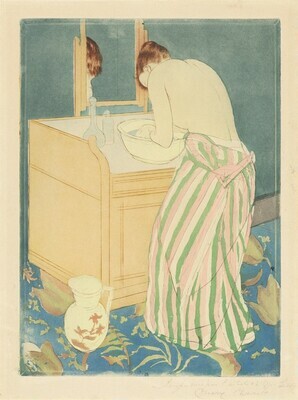 Mary Cassatt: The Color Prints. New York: Harry N. Abrams, 1989, no. 10, iv/iv. Mathews, Nancy Mowll. Cassatt: A Retrospective. New York: H.L. Levin Associates, 1996, p. 173. Foxwell, Chelsea., et al. Awash in Color: French and Japanese Prints. Exh cat. David and Alfred Smart Museum of Art, University of Chicago, 2012: 38. Jones, Kimberly A. Degas/Cassatt. Exh. Cat. National Gallery of Art, Washington, D.C., 2014: no. 69.